This here, dear readers, is a PINT of melty, boozy cheese. I can't think of a better way to celebrate St. Patrick's Day this Sunday, can you? I couldn't pass up the opportunity to recreate a pint of the black stuff in fabulous fromage form. 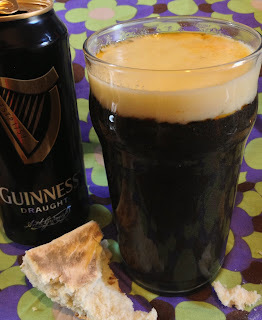 I've used the components of a Black Velvet cocktail (traditionally Champagne and Guinness, but we're substituting Cava here for financial reasons) to make two different coloured and flavoured layers of cheesy goodness. Yes, it's novelty food, but it tastes amazing too. And really, St. Paddy's is THE time for novelty. Wear your green felt leprechaun hat while you cook. If making cheese look like a drink isn't your bag, this tastes just as good all mixed together (and you can ditch the food colouring, although I for one am in dire need of a few more E numbers in my life). Just add the Cava to the Guinness in step one, and use the whole batch of cheese in step three. Put the Guinness, lemon juice, Worcestershire sauce and garlic in a large saucepan and heat to a rolling boil. In a separate bowl, sprinkle the cornflour over the grated cheese and mix well. Remove 50g of the cheesy mixture and set aside for later. Handful by handful, add the larger quantity of cheese to the Guinness, waiting until each handful has melted before adding the next. Whisk constantly during this process, until the cheese is used up and you have a smooth mixture. Add the mustard powder and stir. Add a few drops of black and red food colouring until the cheese is the colour of Guinness, and stir well. Warm a pint glass by running it under increasingly hot water. Dry, and pour the cheese into the glass slowly, until it's about two inches from the top. Pour the Cava into a clean pan. Heat, and add the remaining cheese and flour mixture. Whisk until smooth. Over the back of a large spoon, very gradually pour the pale melted cheese on top of the Guinness fondue. This will ensure the layers remain separate. Serve immediately, with hunks of soda bread, potatoes, chipolatas, or whatever you feel like dunking! Have a cheesy St. Patrick's Day! How do I love thee? Let me count the cheese. This looks AMAZING on a hitherto undiscovered scale! What. WHAT. This is completely amazing. I don't even like Guinness or fondue and yet I want to stick my head in it.